Each ice cube is approx. 2" x 1.5"
Do you ever peer into your glass, filled to the brim with your favorite beverage and think, ugh how boring! Submerged inside the refreshing, tasty liquid, a handful of ice cubes bob up and down, it's an all-too-familiar sight you've seen so many times before. Yes, it's thirst-quenching but it's a view that bores us to tears, in fact, we just may start crying, catching every tiny tear with our glass. 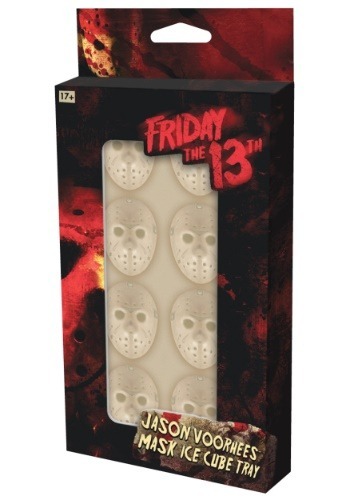 Luckily, Jason Voorhees is here to save your drab drink and save the day. (Whoa, that's a sentence we never thought we'd type!) The Friday the 13th Jason Voorhees mask ice cube tray guarantees every sip feels as exhilarating as running away from the machete-wielding psycho in a summer camp surrounding. They're killer ice cubes, to say the very least! How many people can say their ice cubes offset their costume? Enhance your drink with a matching Jason Voorhees costume!